I HAVE A NEW FAVORITE SALAD!!! I’m not kidding – I could probably eat this stuff every day!!! In fact, I think next time I will add some chicken and then have it for lunch for the week!!! 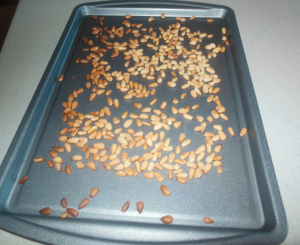 Toast pine nuts – sprinkle on small baking sheet and toast at 375 for about 5 minutes. Zest lemon; juice lemon into the zest and add olive oil. Sprinkle oregano & dill into lemon mixture and set aside. 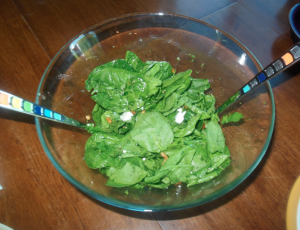 Combine spinach & mint in large bowl. Just before serving, mix lemon dressing, spinach & pine nuts. 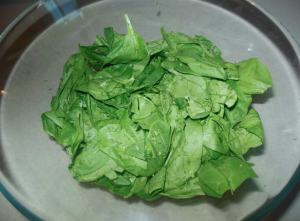 Maybe not the greatest picture because there isn’t much color but you have got to try this salad – it is so good!!! Light, refreshing and easy to throw together!